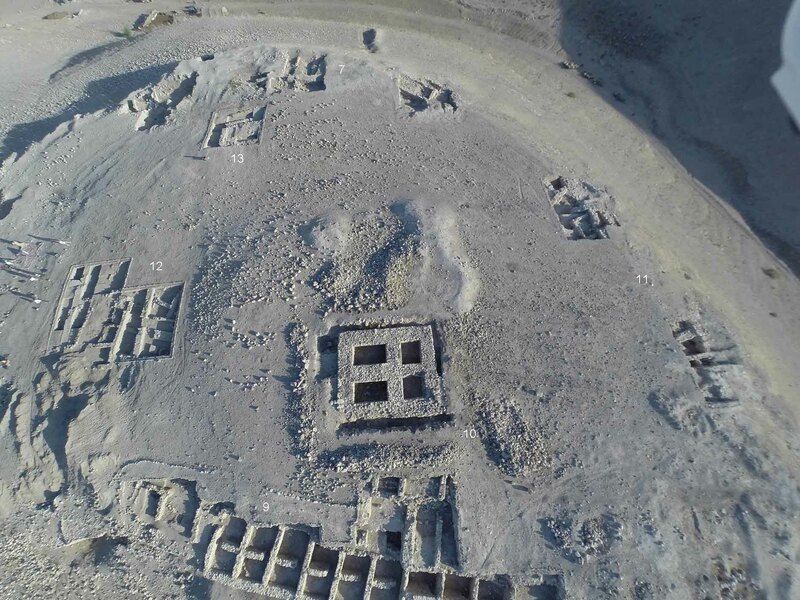 In previous seasons excavations have concentrated on the periphery of the city of Tall Abu al-Kharaz which is a twelve-hectare multi-period tell in the Central Jordan Valley. 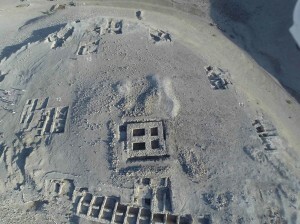 Tall Abu al-Kharaz flourished during more than 4000 years from the Early Bronze to Islamic times, viz. from roughly 3200 BC to the 10th century AD. The main object of the field work in 2014 was to investigate – for the first time – the area around the geographical centre of the city (Area 12). In accord with the objective from 2010 to 2013 preference was given to further investigation of the Iron Age sequence, i.e. 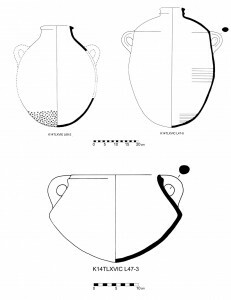 the period from the 12th to the 7th centuries BC that corresponds to the local phases IX–XV. 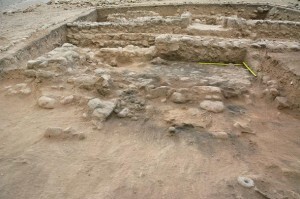 Another task was to extend the excavations in the northern part of the city, Area 7, which produced essential information on the Iron Age, towards the south (Area 13) in order to generate a coherent picture of Iron Age occupation in the city’s northern half. 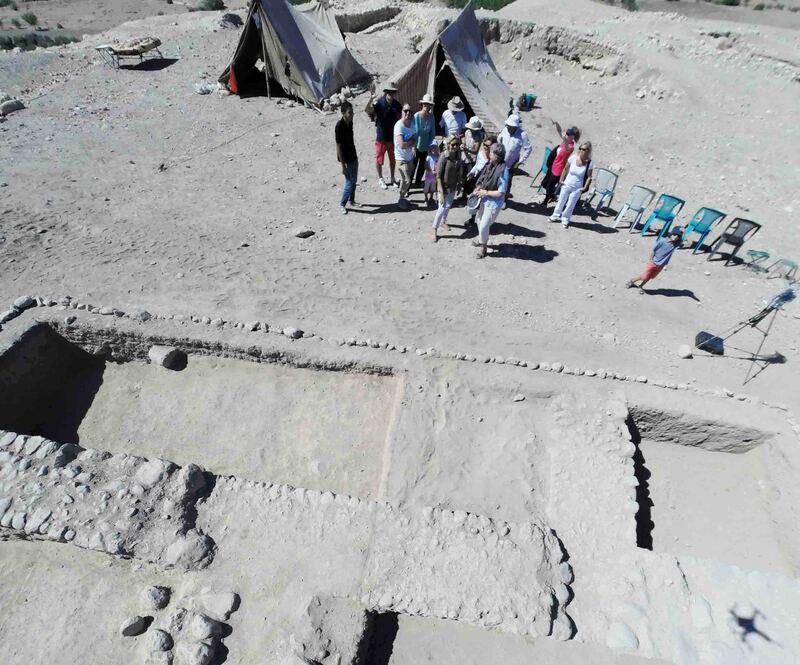 The excavations at Tall Abu al-Kharaz, once again kindly financed by the Royal Swedish Academy of Letters, History and Antiquities, were carried out with the support of the Department of Antiquities of Jordan in September and October 2014. The 2014 team included Professor P.M. Fischer from the University of Gothenburg (director), T. Bürge, MA (assistant field director), D. Blattner, BA (assistant), H. Ta’ani (foreman, trench master) and M. Al-Bataineh, MA (surveyor, draughtsperson). Trench masters were Dr. S. Chandrasekaran, M. Adelhofer, E. Heiss, S. Lauscher and L. Marstorp. The representative of the Department of Antiquities, and recently appointed inspector of Pella, was M. Es-Shalabi from whom much practical help was gratefully received. Logistical support was provided by S. Esbeihat (cook), Y. Suleiman Musa (pottery washing) and M. Mohammed Ahmad (transport). Nine loyal local workers with much experience from previous field seasons came from Pella, Mashare‘a and Yabis. The Royal Court of Jordan, represented by T.R.H. 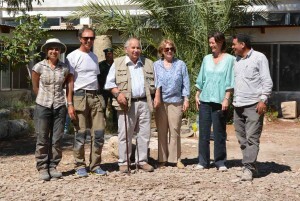 Prince Raad Ibn Zaid and Princess Majda Raad, and the personnel of the Swedish Embassy in Amman, headed by Ambassador Helena Gröndahl Rietz, all of whom showed sincere interest in the project, honoured the expedition by their annual visit. Table 1. Phasing of Tall Abu al-Kharaz. 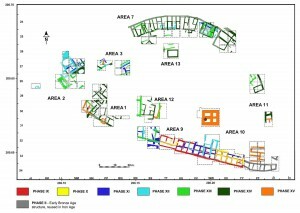 Several structures belonging to Phases XIV and XIII were affected by a roughly 3.5 m × 1.5 m large pit. The pit cut down approximately 1.5 m from topsoil. A human skeleton without any tomb gifts was found at the bottom of the cut, lying on a bed of clay. The cut has been backfilled with disarranged stones intermingled with soil. 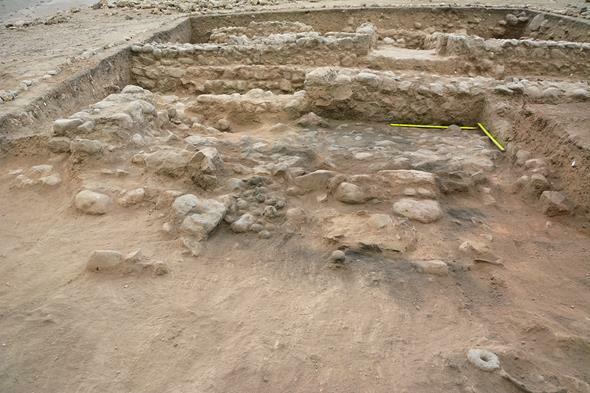 The most recent sherds from the area of the burial are probably from Abbasid times. 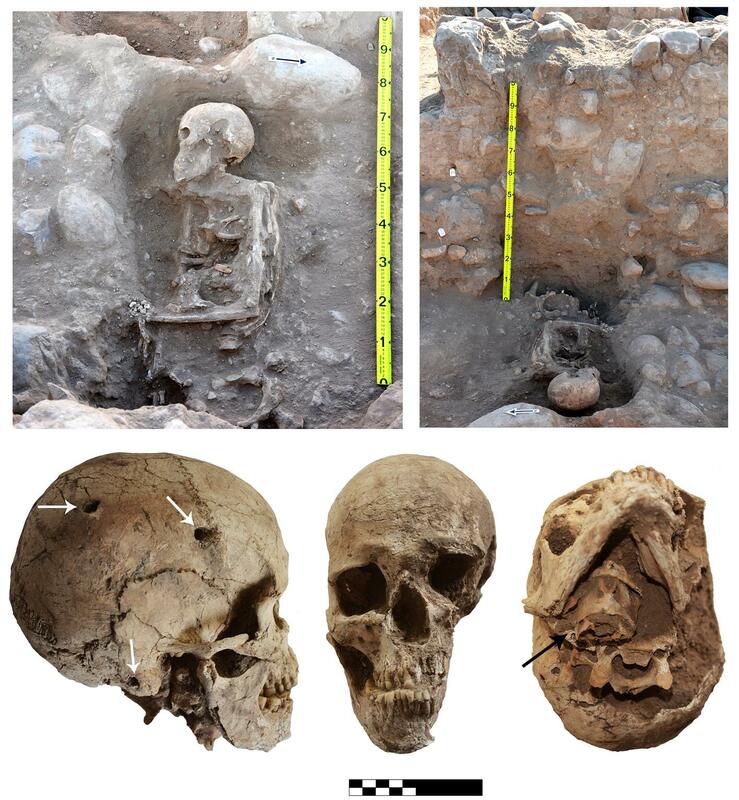 The obviously violently killed 40-year-old female, dated to Byzantine–Abbasid times, demonstrates an ancient “criminal case” where the perpetrator buried the body under tons of stone structures of the Iron Age. 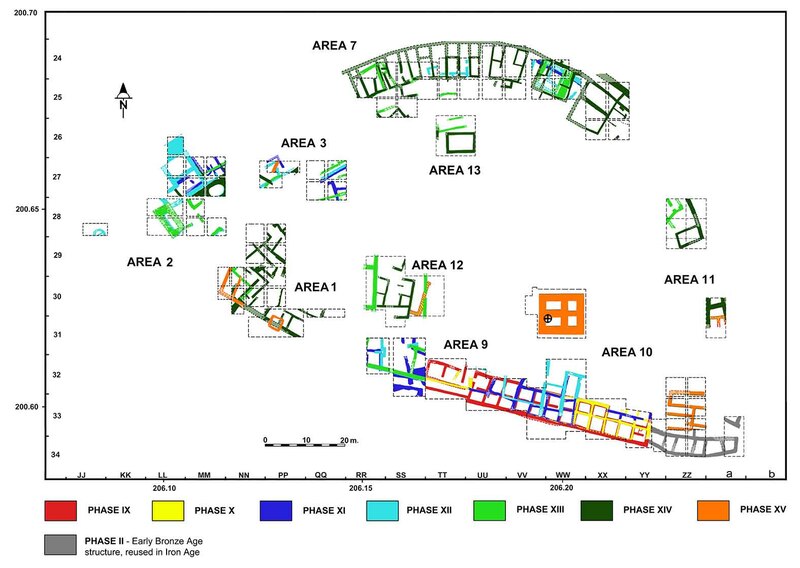 Phase XV, once again, makes the squatter character of this late Iron Age society obvious: the older structures were reused for dwellings and only a few new structures appeared. The situation in the preceding Phase XIV is totally different: We exposed remains of a thriving society. The fierce destruction of Phase XIV by the Neo-Assyrian king Tiglat Pileser in 732 BC followed by an extensive conflagration marks the end of large scale occupation at Tall Abu al-Kharaz: the settlements following the total collapse of the late Iron Age city of Tall Abu al-Kharaz during Roman, Byzantine, Islamic and Mamluk times are of only minor magnitude. 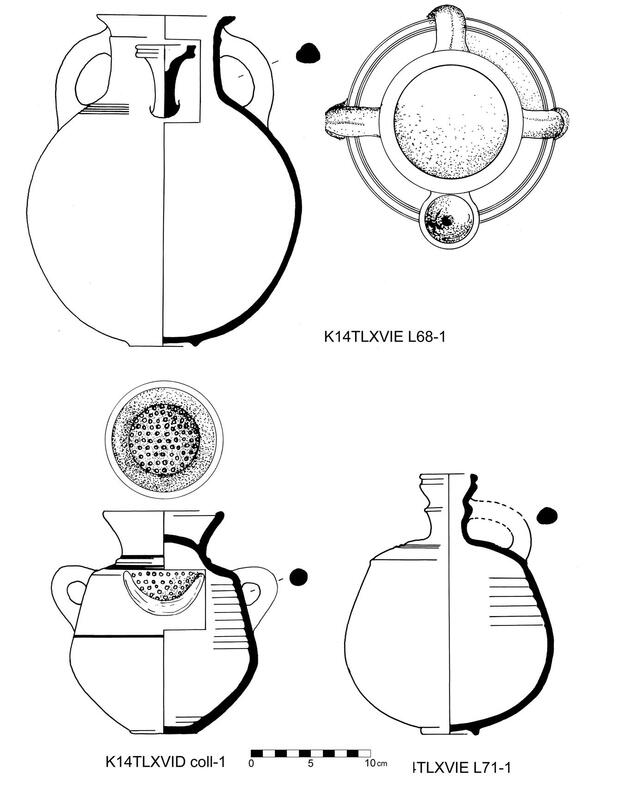 The Phase XIV occupants had intercultural contacts with the Eastern Mediterranean, Phoenician and Neo-Assyrian sphere of culture which can be seen in the pottery which was either imported or at least locally copied. Most spaces from Phase XIV were used for textile production including spinning, weaving and pattern sewing, storage, food processing and the preparation of meals. In addition to remains of caprines and cattle, which dominate, the presence of almost the complete antlers of fallow deer in Phase XIV fits well with our previous osteological investigations. Fallow deer is represented at Tall Abu al-Kharaz by 2.8% of the total number of identified fragments in all periods, and by 5.7% of the total weight. Fallow deer and gazelle were clearly of some significance to the people of Tall Abu al-Kharaz: deer are more abundant in the Iron Age in comparison with gazelle which runs concurrently with the decrease in the relative abundance of gazelle from the Early Bronze Age to the Iron Age. 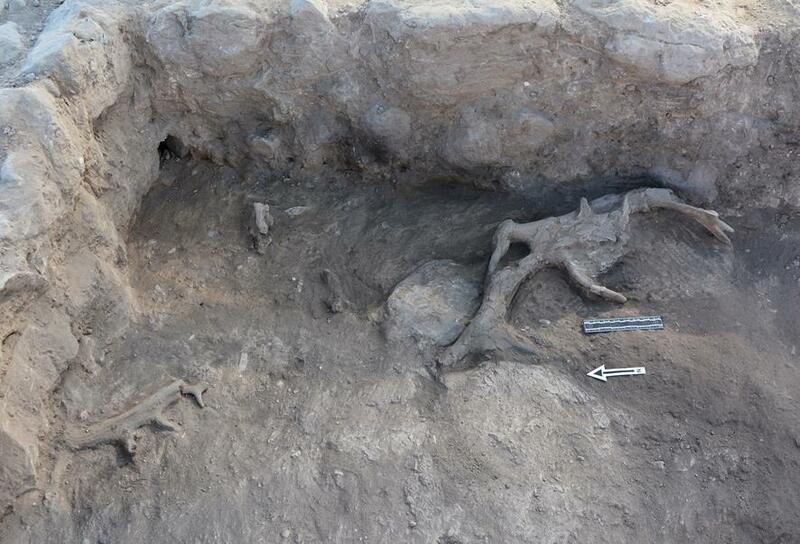 The find position of the antlers from 2014 suggests they were kept as a trophy and/or stored for later use for the production of horn tools. 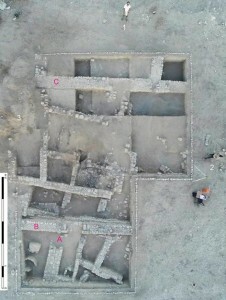 The function of the Phase XIII structures (800–770 BC) was certainly not domestic and we suggest that they had a military purpose (see B and C in previous photograph): they were used as an inner defence line when the outer defence, the city wall along the edge of the upper plateau, had been overrun by an enemy. Early Iron Age remains from Phases IX or X (1100–930 BC) are relatively scarce – although we were able to excavate several complete containers mainly for storage – because of intense building activities in the later Iron Age. 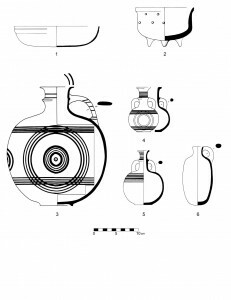 We found evidence of local pottery production in this period. 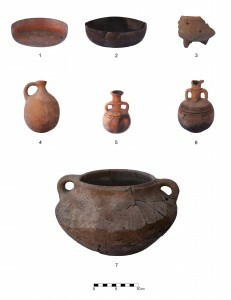 Structures from the Late and Early Bronzes are abundant and were reused by the Iron Age people. Fischer, P.M. Tell Abu al-Kharaz in the Jordan Valley. Volume III: The Iron Age. Contributions to the Chronology of the Eastern Mediterranean 34, Vienna 2013 (558 pp.). Fischer, P.M. The Southern Levant (Transjordan) during the Late Bronze Age, in: A.E. Killebrew and M.L. Steiner (eds. 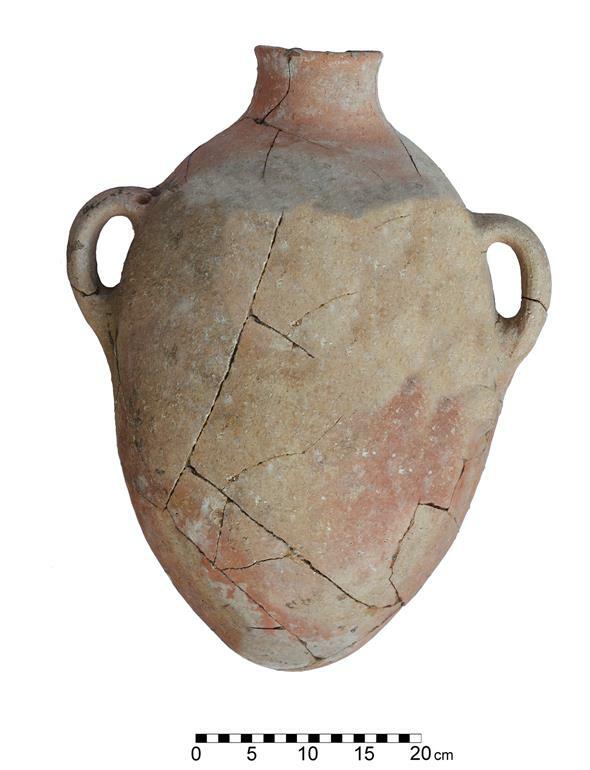 ), The Oxford Handbook of the Archaeology of the Levant c. 8000-332 BCE, Oxford University Press 2014: 561-576. 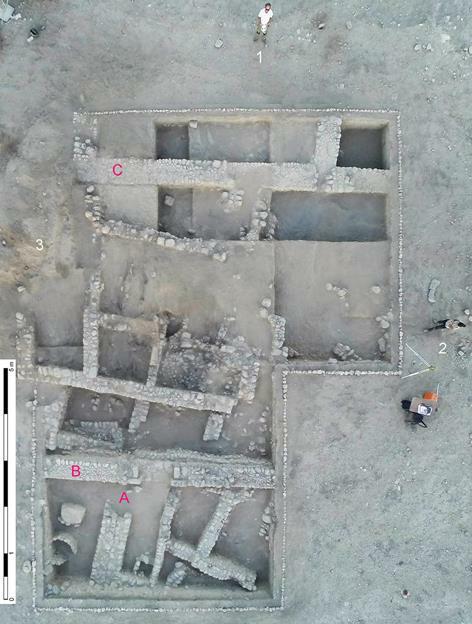 Fischer, P.M. and T. Bürge, Cultural Influences of the Sea Peoples in Transjordan: The Early Iron Age at Tell Abu al-Kharaz. Zeitschrift des Deutschen Palestina-Vereins 129/2, 2013: 132-170. 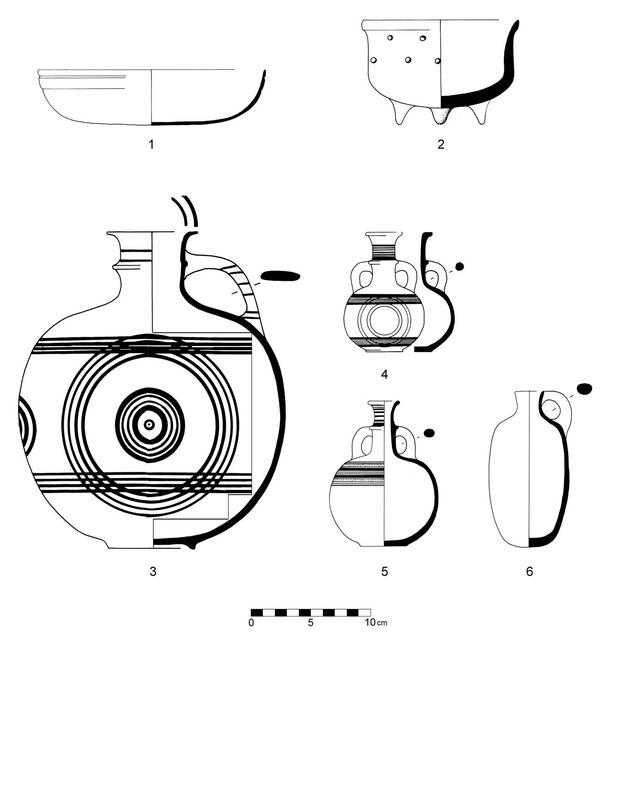 Fischer, P.M. and T. Bürge, The New Swedish Cyprus Expedition 2013: Excavations at Hala Sultan Tekke. Preliminary Results. Opuscula. 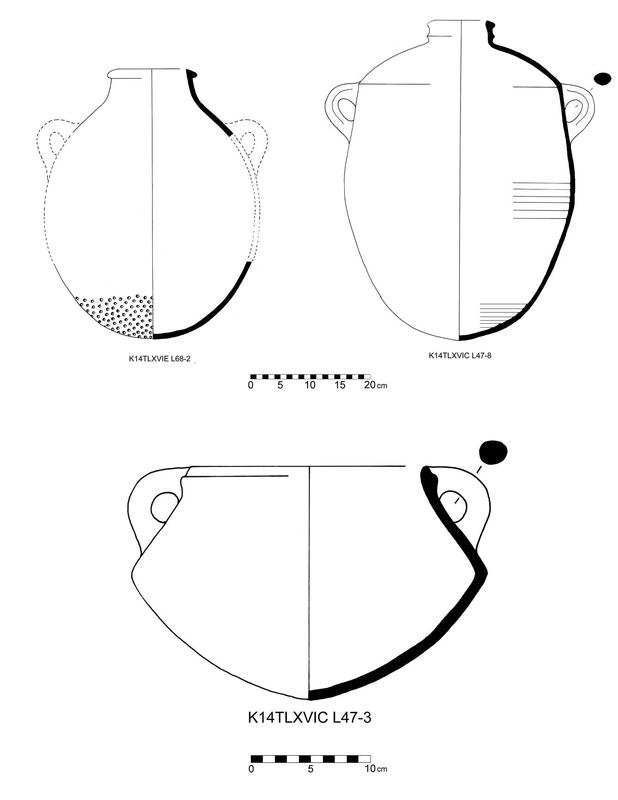 Annual of the Swedish Institutes in Athens and Rome 7, 2014, 37-82 (additional reports in Opuscula 4, 2011; 5, 2012; 6, 2013; and in Opuscula 8 forthcoming 2015).